This lower cost 59 page book on a CD-ROM contains some extracts from one discipline of the "Artistic Pool Manual" and also contains new information. Artistic Pool is the umbrella word, like gymnastics and Trick and/or Fancy shots is a discipline to "Artistic Pool", like parallel bars is a discipline to gymnastics. 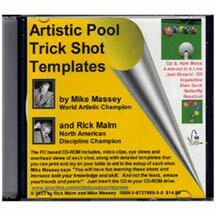 This CD is a good place for amateurs to build a foundation for "Artistic Pool". Learn how to quickly setup several trick shots, no extreme english or squirt knowledge required. You can learn 7 artistic show shots or trick shots. You can create full scale B/W or color template drawings of each shot for your own pool table to aid setup and learning. These templates can not be found in the "Artistic Pool Manual". Insider tips on each shot. See how to adjust if you are missing the shot. Photos, video, and text all on a CD-ROM FlipAlbum for PC usage. Page printing allowed. Includes thumbnails for each page, a table of contents, and an index all with links to the pages. More than 50% of the content is diagrams, shooter's eye views, overhead views, and side views. Product includes more than 20 video clips. You can see each shot being made. Fundamentals of ball "throw" testing and "tapping in" that was also in the "Artistic Pool Manual". Color Virtual Pool 3 (VP3) images that show close up details on the shots. 7 VP3 files, one for each trick shot, can be loaded directly into VP3. 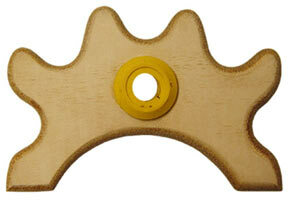 Product includes table images that show close up details on each shot.